The Chrome Sphynx Wrath is a Tactical type weapon that is an upgraded version of the Sphynx Wrath. Rare, liquid chrome stored inside of a solid Sphynx cast. The exact amount to perfectly cover a Sphynx Wrath Trap with powerful, sleek chrome. This highly wind-resistant coating helps lubricate movement, allowing the Sphynx to strike with complete silence. The newly-hardened chrome shell reflects light so well that mice have trouble determining what the blindingly-bright blur pouncing around in front of them is! Combine delicately disassembled Sphynx Wrath Trap Parts with this Chrome Sphynx Wrath Upgrade Kit to unleash the beast! The Chrome Sphynx Wrath is not sold by any Trapsmith. It can only be crafted given the proper ingredients. 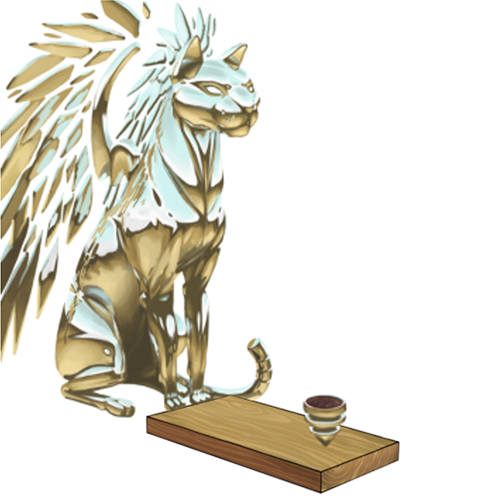 30 June 2015: The Chrome Sphynx Wrath Upgrade Kit was made available at Ronza's Traveling Shoppe, allowing the Chrome Sphynx Wrath to be crafted for the first time. This page was last edited on 6 February 2019, at 15:57.